I am not a lawyer. This is not legal advice. Do not take it as such. I’m copying pictures from the web for my new website. We just copied-and-pasted the content we found on a similar business’s website. Don’t worry about a blog image–I’m going to use a pic I found on Google. I don’t think these clients viewed what they were doing as stealing or copyright infringement. Instead, I think many of us don’t fully understand how copyright works. I don’t know about you, but I never had a copyright course in school. What’s more, the social sharing environment is so relatively new–if Twitter were human, it would be in elementary school–that lines regarding what’s appropriate and what’s not are still a bit blurry to some. So what’s a blogger or small business person to do? 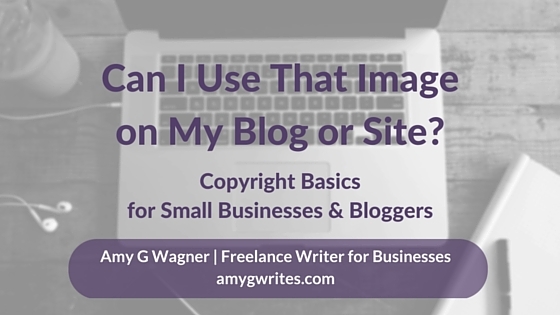 I found a cool image on Google that I want to insert into my blog post–can I use it? Long Answer: Just as Lord Voldemort descends on Hogwarts every school year, copyright is a magical cloud that descends the moment a person creates a work in a tangible form, whether it’s writing the first words of a novel on a bar napkin or taking a pic of a dog shredding a pillow. The person who created the work owns the copyright, unless he or she created it as part of their responsibilities as an employee–in that case the company usually owns it. The image has been placed in the public domain, which means the copyright expired or the owner has given up rights to it. But the image owner wouldn’t have posted the picture online unless they wanted the exposure…so I can use it, right? No. Really, no. Frankly you or I usually haven’t the foggiest idea why a particular person posts a particular pic. If you want to use an image that’s not licensed for use or within public domain, the copyright holder is the boss of you. The image doesn’t show that little copyright circle. So I can use it, right? No. A formal copyright notice isn’t required anymore (although it used to be). Remember, copyright is a magical cloud of protection that descends upon creation. But isn’t there a fair use sort of a thing? A journalist quoting from a magazine article for a news report. Using a photo owned by someone else to add visual pop to your blog, my blog, or anyone else’s is, in many cases, not fair use. Don’t use random photos off the web–each one belongs to somebody. Choose pics licensed specifically for use on websites or blogs. I’ll post more blog pic resources and ideas soon, but in the meantime check out this fantastic list from Carly Spec on HubSpot Blog: 10 Sites for Free, Non-Cheesy Stock Photos.